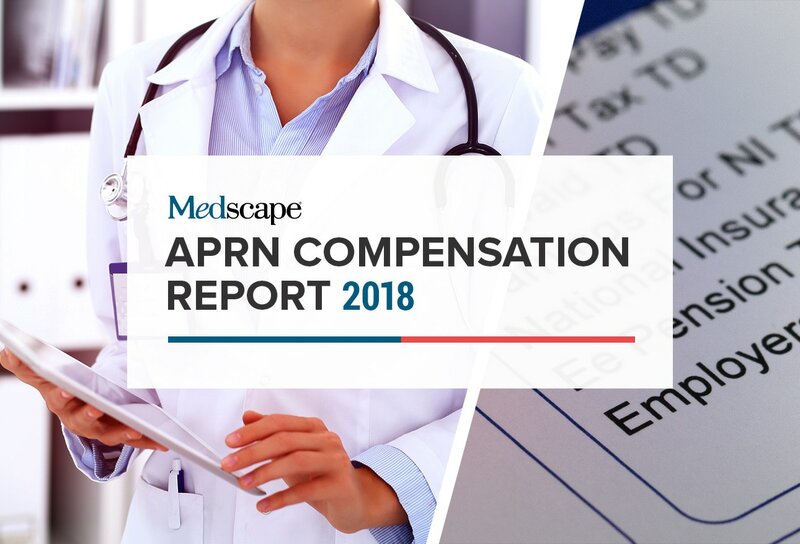 Medscape invited practicing advanced practice registered nurses (APRNs) from the United States to participate in a 10- to 15-minute online survey about annual earnings as part of a larger survey that included registered nurses (RNs) and licensed practical nurses (LPNs). After a recruitment period lasting from June 12 through September 30, 2018, a total of 10,282 nurses met the screening criteria and completed the survey, 3271 (32%) of whom were APRNs. This group includes 375 certified registered nurse anesthetists (CRNAs), 2006 nurse practitioners (NPs), 501 clinical nurse specialists (CNSs), and 389 nurse midwives (NMs). This slideshow reports survey findings from those APRNs. Where applicable, we compare findings from the current year with those of last year's compensation survey. A separate report describes the survey findings from RNs and LPNs. Interested in commenting on what you see in this report? Go to slide 29 for more information. The acute care hospital is the primary work setting of 71% of CRNAs, 42% of CNSs, 24% of NMs, and only 15% of NPs. By APRN type, from 3% to 12% hold positions in academic settings as nursing faculty members. The "other" work setting category includes such diverse healthcare settings as public health, long-term care, hospice/palliative care, school/college health, and industry-related positions. This year, 2% of NPs reported working in retail health clinics. The gross annual income of each group of full-time APRNs increased from last year's survey, by 1% for CNSs, 4% for NMs, 5% for CRNAs, and 6% for NPs. As found in previous surveys, CRNAs reported the highest average earnings ($192,000). This year, the second highest incomes were reported by NPs, and CNS respondents reported the lowest annual earnings. All of these annual incomes among full-time APRNs, however, were significantly higher than those reported by RNs, who reported average earnings of $81,000. (Note: Annual incomes reported here are not adjusted for inflation or cost of living). For NPs, who comprise the largest group of APRNs among our respondents, annual pay was highest ($120,000) for those working in acute care hospital settings and lowest ($95,000) for those working in school or college health service settings. NP wages increased across all work settings compared with last year's report. This year's survey had a new question about the certifications held by NPs, to determine whether annual income varies by specialty certification. More than one half (55%) of NPs hold the family NP certification, far exceeding the proportions of NPs holding certifications in adult-gerontology primary care (12%), pediatric primary care (8%), psychiatric/mental health (7%), adult-gerontology acute care (7%), women's health (5%), neonatal (2%), emergency (1%), and pediatric acute care (1%). Earnings ranged from a low of $108,000 annually for pediatric primary care NPs to $120,000 for psychiatric NPs. The numbers of neonatal, acute-care pediatric, and emergency NPs were too low for analysis. Although the majority of APRNs are employed full-time (at least 36 hours weekly), the proportion of part-time APRNs increased significantly, across the board, from last year. About 15%-25% of APRNs work part-time, and 2%-4% work in per diem ("as needed") positions. The increase in APRNs working part-time is a trend that we have observed over the past few surveys, and it may be related to the aging and pending retirements among the APRN workforce. In general, compared with last year, we saw no difference in the proportions of APRNs who reported being paid by salary or have an hourly rate of pay. More CRNAs were paid by the hour (37%) compared with NPs (20%), CNSs (13%), and NMs (14%). The hourly rate of pay for full-time CRNAs rose when compared with the previous year, as did hourly rates for full-time and part-time NPs. Another new question in this year's survey was employment status, with three options: employed by medical group or hospital, employed by private NP practice, or independent contractor. Among all APRNs, 85% are employed by a medical group or hospital (90% of CNSs, 87% of NMs, 85% of NPs, and 78% of CRNAs). A private APRN practice employed 2% of CNSs, 7% of NMs, 9% of NPs, and 5% of CRNAs. CRNAs were most likely to be self-employed (17%) compared with CNSs (8%), NMs (6%), and NPs (6%). We had enough NP respondents to analyze pay differences according to employment status, and found that among NPs, average annual gross income did not differ significantly among these employment types. Practice ownership remains uncommon among APRNs. From 4% to 17% of all APRNs own their own practices, with CRNAs being most likely to do so. Practice ownership appears to be economically advantageous; practice owners earned about 10% more than non-owners. Practice ownership did not increase appreciably over the past year. We asked APRNs whether their regular compensation was based on an incentive system, such as a productivity or pay-for-performance bonus. Productivity and/or pay-for-performance bonuses were given to 19%-34% of all APRNs. Across specialties, APRNs who received productivity bonuses earned more than those who didn't. For example, NPs who received productivity pay earned $116,000 annually, compared with $110,000 for those who didn't receive productivity pay, a difference of 5%. We asked APRNs about their clinical practice arrangement. Currently, so many states require collaborating physicians that most APRNs are not independent practitioners. Indeed, among CRNAs, NPs, and NMs, 75%-79% of these APRNs are required to have a collaborating physician and a collaborative practice agreement. One exception was found: Among CNSs, 43% reported being independent practitioners. The minimum entry-level educational requirement for APRNs in the United States is the master's degree. In this year's survey, 85% of APRNs held a master's degree and 15% held a doctorate (PhD or DNS). The average annual gross income of APRNs with doctoral degrees was 4% higher than the income of those with only a master's degree. Men represent two fifths (43%) of CRNAs and substantially smaller proportions of CNSs (5%) and NPs (9%). Male NMs remain relatively uncommon, representing only 1% of NMs. The historical gender income gap between male and female APRNs persists. Among the total APRN group, men earned more than women across the board. We had sufficient numbers of men in two APRN groups (NPs and CRNAs) to assess the size of the income gap, but not among NMs or CNSs. Male CRNAs reported annual earnings that were 14% higher than for female CRNAs, and male NPs earned 15% more. Compared with 2017 data, it's evident that the gender-related income gap isn't narrowing. However, the gross income differences alone are only part of the story (see next slide). This graph makes it clear that some of the work-related differences between men and women in advanced practice are at the root of the gender pay differential. Men outnumbered women in every category of work habits that have an impact on earnings. More men than women worked in high-paying acute care settings, routinely worked overtime, and supplemented their regular nursing income. Another factor that may drive the higher earnings of men is APRN practice ownership. Men were more likely to own their own practices (13% of men, 5% of women). We asked how much the APRN's income rises with increasing years of experience. We had adequate data to answer this question only for NPs. The average annual income increased according to the NP's years of experience only to a point. The annual income for NPs who had been in practice for over 20 years was similar to annual incomes of APRNs with 11-20 years of experience. This finding suggests that the most experienced APRNs had reached a salary cap, beyond which base pay no longer increases. Because NPs comprise the majority of APRNs in our survey, this slide shows the average annual earnings of NP respondents only, which were highest in the Pacific region ($130,000) and lowest in the East South Central region ($103,000). APRNs working in the same region, or even in the same state, can have markedly different incomes depending on the type of community (urban, suburban, ex-urban, and rural). The largest proportion of APRNs, across every APRN category, work in more densely populated urban areas, where the most jobs can be found. CRNAs (18%) and NPs (15%) were more likely to work in rural areas, and CNSs (55%) were more likely to work in urban areas. When incomes of APRNs working in different community types were compared, no significant difference in earnings was found between those who worked in urban areas versus suburban areas. The average annual income of NPs was comparable in all four community types; those working in rural areas earned only slightly less than NPs working in more densely populated urban communities. Like last year, CRNAs working in rural areas reported the highest incomes, a finding that may be explained by supply and demand. Fewer than one half (44%) of all full-time APRNs who are paid an hourly wage routinely work overtime, and 58% of those who work overtime report that it is voluntary. Almost one third (30%) of all APRNs report working a combination of mandatory and voluntary overtime. On a weekly basis, APRNs typically work 1-5 hours of overtime (52%), and 18% work more than 10 overtime hours weekly. Most overtime worked by APRNs is compensated, although 9% reported that they were not paid, and 5% did not receive pay but could take compensation time for the overtime hours worked. Most APRNs (52%-62%) reported that their annual gross income had increased compared with the previous year, and 30%-38% reported that their income had not increased. Only 5%-11% reported that their annual income had dropped. In this year's survey, we asked APRNs if they carried their own malpractice insurance in addition to professional liability coverage provided by their employers, and how much this insurance costs annually. A relatively small proportion of APRNs carry additional malpractice insurance, ranging from a low of 4% (NMs) to a high of 38% (CNSs). The annual cost of malpractice insurance differed by APRN category, with CRNAs paying the most and CNSs the least. The fact that CNSs are most likely to carry their own malpractice insurance may be explained by the low rate of CNSs who receive liability coverage as an employment benefit (see slide 25). Another new question on this year's survey was whether the APRN routinely took call (evening, night, weekend, holiday) and whether this call time was compensated. More than two thirds of CRNAs reported taking call, and most reported that they are paid for call time. Although fewer CNSs and NPs take call, they are also more likely to do so without call pay. Some APRNs receive compensation time instead of extra income for taking call. Union membership is relatively uncommon among APRNs. Only 11% reported being members of unions or collective bargaining units, similar to the findings of last year's survey. APRNs who belonged to unions earned more, on average, than those who didn't ($123,000 vs $119,000) although the difference was not significant. We asked full-time APRNs what benefits were offered by their employers, whether or not they took advantage of these benefits. Benefits offered were similar across APRN groups. Like last year, the benefits offered most frequently were paid time off, health insurance, retirement contributions, education reimbursement, and professional liability coverage. Although professional society membership dues are paid as an employment benefit to 20%-57% of APRNs, more than 80% of all APRNs report belonging to a professional society or association (data not shown). Depending on the educational route taken from RN to APRN and the final degree earned (master's or doctorate), it can take from 5 to 8 years to complete an APRN's college education. As a result, many APRNs are still paying off their student loans. Whether the APRN is still paying off student loans varies by APRN age; 67% of those younger than 35 years, 51% of those aged 35-54, and 18% of those aged 55 or older were still paying off student loans. A small majority of APRNs across the board reported that their compensation was fair for the work they do. Compared with last year, however, significantly fewer APRNs believe that they are fairly compensated (67% last year, 61% this year). Men were more likely than women to report being fairly compensated (70% vs 63%). No differences in satisfaction with compensation were found by age, union membership, or length of time practicing. A feeling that compensation is fair ranged from 45% for APRNs working in a retail clinic to 74% of APRNs who work in an industry setting (insurance/health plan). We invite you to comment on this year's survey findings.